With technology advancing at such a rapid pace, newer and better versions of digital cameras are being introduced about every month. More and more manufacturers are coming up with models that are sturdier, better in quality, stylish, offer a variety of features and a whole lot more, for all photographers. So to help you keep your memories with you forever, we have compiled the top choice of photographers from around the world. Is Price A Major Consideration? The Canon PowerShot ﻿SX410﻿ IS is the top rated digital camera, under $ 200 for you. The most striking feature of this model, that also makes it a favorite of many, is the long zoom. It actually nears about 40x the original focal length of the lens. And so, this makes it a top choice to be taken on vacations, for the outdoors and for the complete coverage of in-house parties and functions as well. Another superb camera is the Sony DSCWX220/B 18.2 MP Digital Camera. One great choice, especially if you are looking for a light sensitive solution for your photography needs. Plus, it comes with the built-in Wi-Fi that enables the user to post photos and videos directly onto the social media sites. Another one by Sony, the Sony W800/S 20.1 MP Digital Camera is a low cost, simple and easy to use a digital camera. With its 5x optical lens, zooming and capturing beautiful photos is really easy. It also comes with the Sweep panorama mode and the smile shutter technology, that makes photography easy and fun for everyone. 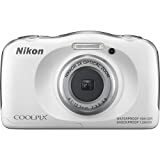 If you are looking for a strong, sturdy and reliable camera for all your expeditions be it surfing, snorkeling or hiking up the mountains, you must take a look at the Nikon﻿ COOLPIX S33 Waterproof Digital Camera. Really easy to use, it lets you record sound clips, HD videos and take quality shots, even at 32 feet below water. 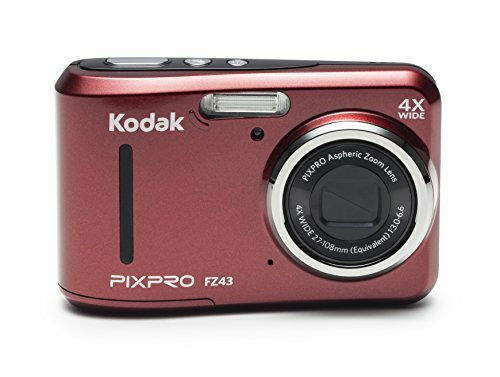 Last but never the least, the Kodak PIXPRO Friendly Zoom FZ43 16 MP Digital Camera with 4X Optical Zoom is a very simplistic, easy to use and quality camera, suitable for the young and old alike. This one enables the user to take quality shots, indoors and outside with ease and also has the red eye removal and facial recognition features. Our top pick of the lot is the Canon Powershot SX410. The small wonder lets you take amazing photos and capture the complete footage, thanks to its Canon Digic 4+ image processor. Plus, if you are an avid photographer, you don’t have to worry about the batteries running out during the longer sessions. There is an economy mode that helps save up on the energy, giving you a longer battery life, no matter where you are. With a 24mm wide angled lens and 40x digital zoom, the results are always beautiful, crisp and sharp, letting you relive the moments for years to come. Moreover, along with the manual ring for setting up the focus yourself, you also get lots of autofocus options; such as contrast detector, facial recognition, live view, etc. Quite compact, though not pocket sized, the camera also comes with the image stabilization feature. Since even the tiniest twitch of a muscle could ruin the image, stabilization helps produce clear, focused, and sharp results, without any aberrations. You can get photos in the size 5152 * 3864 pixels and also record 720p HD videos with it as well. 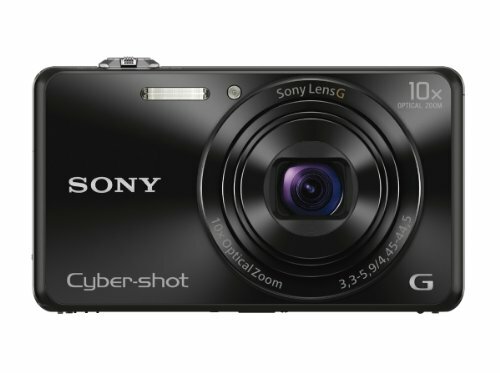 When talking about the best digital cameras, you simply cannot miss out Sony. The Sony DSCWX220 comes with the 20x zoom G lens that produces high quality and sharp images. Plus the Exmor R CMOS Sensor makes it perfect for the low light photography. Enjoy uploading your favorite pictures and videos directly on Facebook and other social media platforms, thanks to the Wi-Fi connectivity. If you are looking for a quality, compact sized camera for sports photography, then this is your best bet. The super-fast burst rate allows you to take continuous shots for ten frames. For handheld shooting too this is a great option, with built in stabilization via the Optical SteadyShot you no longer have to worry about getting a shaky, blurred image. Also, shoot 60p HD videos and record high-quality sound. Available in the sleek black and gold colors, it makes it easy to connect your Sony SD, SDXC and other cards for additional storage space. You can also view your photos and videos as and when taken on the 2.7” wide LCD screen. 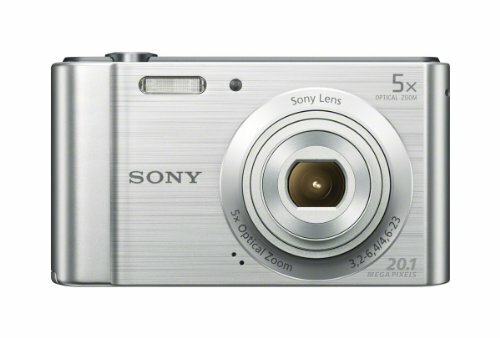 Next, we have the Sony W800/S 20.1 MP Digital Camera (Silver). Now if the thought of complicated digital cameras takes you off exploring your photographic skills, you must give this one a try. Not only is it really easy to use, but also allows you to take stabilized, clear photos every time. The SteadyShot stabilization is one great feature that makes it a top ranked camera amongst its counterparts. The MP Super HAD CCD sensor further gives you clear and enhanced image results, that makes it a great choice for all your macro photo shoots. You can also add some fun effects to your photos. There are four modes for images and videos both, that you can play around with and get enhanced, color corrected and optimal results, for all your pictures and videos. This one comes with a 5x optical zoom that gives you sharp images and HD videos. If you ever run out of battery, simply plug in the USB cable to your laptop/charger and have the camera ready again in no time, wherever you are. Another feature is the smile shutter technology. Simply smile at the camera and it will automatically detect the facial lines and snap away. Best for beginners and for everyday photography. 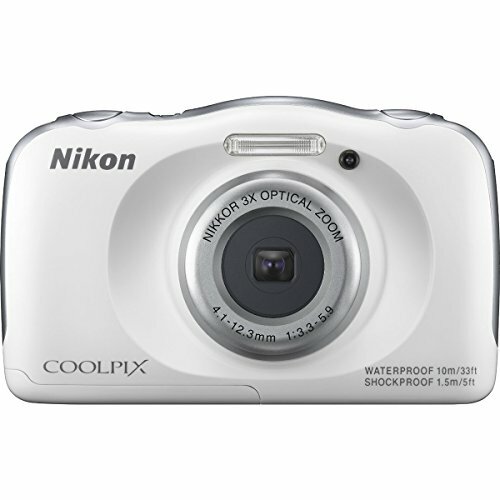 Take your photography skills quite literally to a whole new level with the Nikon COOLPIX S33. The camera is actually waterproof! So whether you wish to take it to the beach, out in the rain, or under the water surface, this is the best one you can get, and at such an amazing price as well! Claimed to be waterproof (yes water proof, not water resistant like many others), it can be immersed up to 32 feet into the water and will stay intact. Plus, it is also shock proof and can resist the weather extremities quite well too. A fun and reliable camera for the adventurers indeed. Plus, the package includes the rechargeable battery and USB cable, as well as a safety strap and cleaning brush. So you can keep the dust and other dirt particles away from the lens, as a routine. This is especially useful on the sandy beaches. So whether you are a pro mountaineer, scuba diver or just not good at holding a camera, this one is just made for you. With the shock proof body, sturdily built exterior, you can always rest assured it can take on minor falls and other such accidents really well. As our final addition to the list, we have the Kodak PIXPRO digital camera. This is highly affordable and the best for everyday photography. With the 4x optical zoom and 27mm wide angle lens, you can make the most out of your precious moments and take quality shots all day long. Also, shoot videos (HD 720p) and snap away your favorite objects easily. The camera is constructed to be really simple to use and also comes with the face detection technology and red eye removal, to ensure that your pictures always stand out. One surprising aspect is that it runs on two AA batteries. So if you are traveling or planning to go up for a hike, just replace the batteries, no need to wait or find a slot to have the batteries charged! You can also select from different modes and take shots to suit the conditions and requirements. For instance, the sports mode makes it easier to shoot faster and to take multiple shots, so that the chances of the final image getting blurry can be minimized. However do keep in mind that these cameras while are getting more affordable for the masses, however latest technology has added to their size and also introduced much-complicated models. So, in order to stay abreast of the latest specs, you must have some idea about the basic elements to look for. Then there are those cameras that come with changeable lenses. This opens up a wider window for you to experiment using different lenses without having to purchase a newer model every time. The quality of the picture is one very important aspect. This is the result of the sensor and the size of the sensor in the model you purchase. The larger the sensor, the better quality the image. For normal video shoots, a good auto focus may be just the thing you need. However, for the advanced videos, you may have to look for additional specs such as touchscreen controls, tone curves, all-intra codecs, etc. Large zoom cameras are great for traveling and for capturing fast moving footage without any aberrations. You must have a good autofocus if you plan on using the long zoom lens. Very important, especially if you intend to shoot in the wild or during the extreme weather conditions. Many of the lenses have a dust sealing that keeps your camera safe from such elements and other weather conditions. Do some market research. Read customer reviews and learn about the latest features and additions to these cameras. You can also go to your nearest store to get a ‘feel’ of the camera you are planning to buy. The practice will help you gauge how comfortable you are with the camera before the purchase. A great feature to look for is the Wi-Fi connectivity. Many of the latest cameras, make the posting of pictures really quick and easy without having to connect the camera to your PC or laptops. Saves time, no? No matter how much the salesperson pressurizes you, the resolution does not make much difference. (Unless you are looking to take some professional shots). For the general photographer, the answer is No. However, if you are a professional photographer you may be aiming for the higher end models. These low budget cameras under $200, let you make the most of the moment by taking out the best of creativity along with your photography skills. Whatever catches your interest be it wildlife photography, home photo shoots or landscape photography, you can click the most striking photos using even your low budget camera. While they may not be as high quality or extremely crisp, they will still yield good results, again depending on your skills. It may not seem easy when it comes to selecting the right brand of digital camera for your home. However, with a few pro tips and knowledge about the features, you can make an informed decision. You really don’t have to spend TOO much on a digital camera, especially for everyday photography. 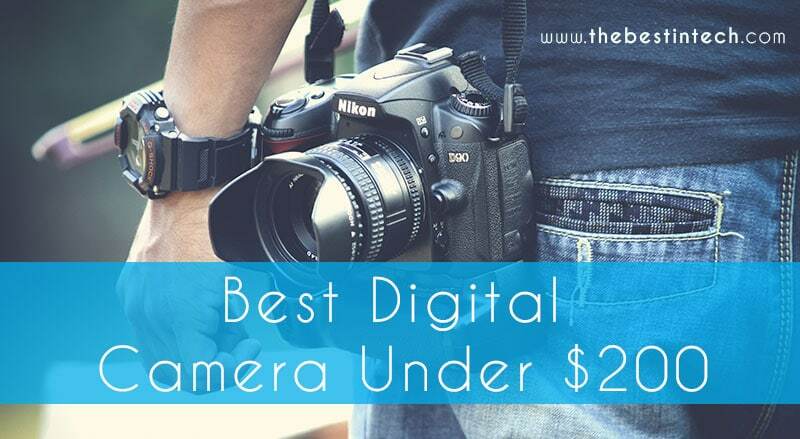 When you can get the best results with these top rated under $ 200 digital cameras, you can preserve moments as and when they unfold before your eyes. So bring home your compact digital camera today and make the most out of your photography skills capturing beauty at its best.